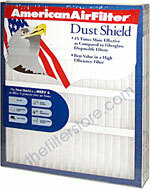 The Dirt Demon Dust Shield ™ is 15 times more effective compared to fiberglass disposable filters. It helps protect your air from pollen, household dust, dust mites, mold spores, pet allergens and microscopic fungi. The Dirt Demon Dust Shield is rated MERV 6. Easy to install. Lasts up to 90 days. According to the EPA, indoor air is 2 to 5 time dirtier than outdoor air. As the dirty air moves through your furnace or air conditioner, a high efficiency filter will remove more potentially harmful airborne particles and allergens. So, replacing a standard fiberglass filter with a more efficient filter like the Dirt Demon Dust Shield is the simplest and most cost effective way to provide better air for your family. Uniform size virgin fibers are assembled in closely controlled blends to create a media that is both self-supporting and remarkably consistent in performance. The self-supporting characteristics allow a pleating pattern that promotes excellent dust holding and resistance characteristics. The Dust Shield meets or exceeds all current expectations for service life and required airflow and has a guaranteed Minimum Efficiency Reporting Value (MERV) of 6.